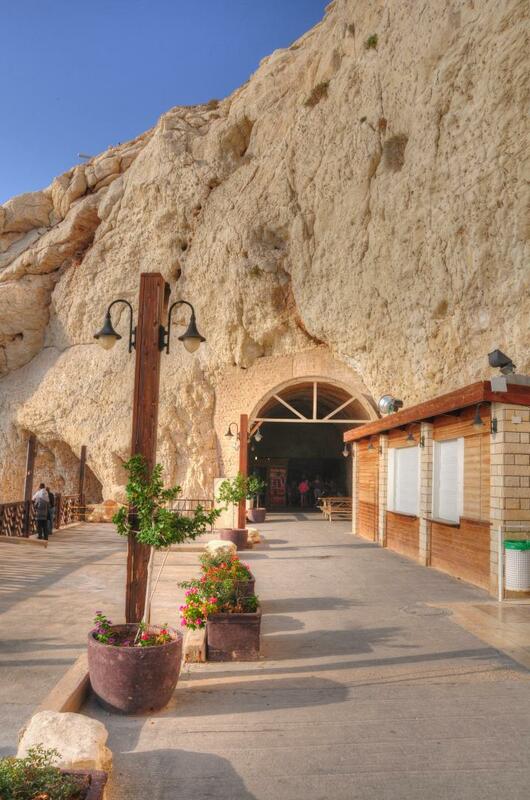 Located on the western side of the border with Lebanon, this tourist attraction nature wonder offers amazing views of the grottoes and tunnels. Psalms 93:4: "The LORD on high is mightier than the noise of many waters, yea, than the mighty waves of the sea". 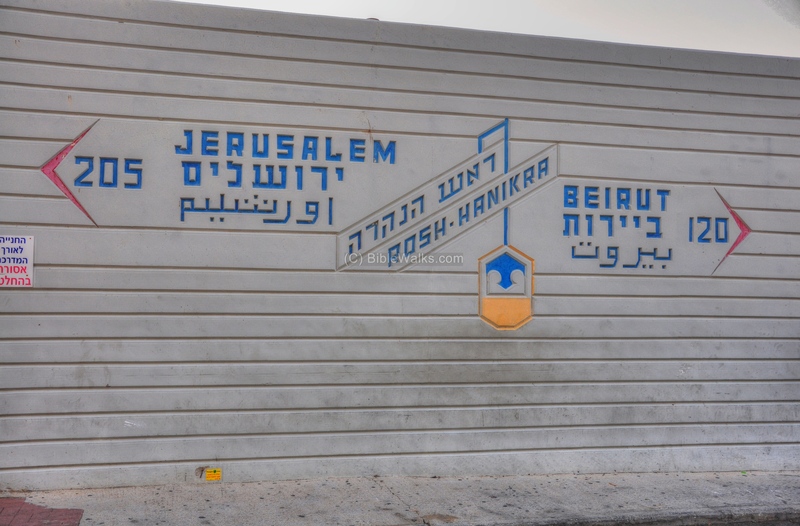 A unique tourist attraction located on the border crossing with Lebanon, on the north-west edge of Israel. A short cable car ride descends down to the British railway tunnels and bridge. A tunnel allows the visitors to reach the sea caves (grottoes) and watch the interaction of sea waves and the white rock. 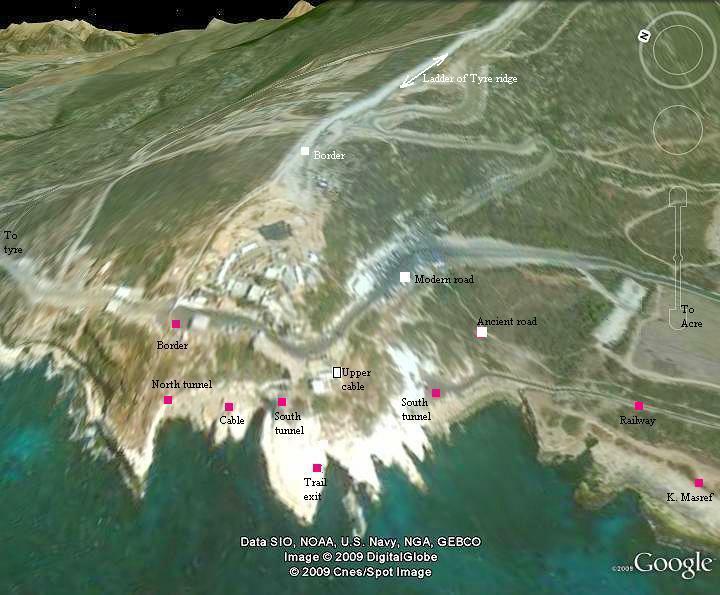 An aerial photo of the area around Rosh Hanikra is shown below, indicating the major points of interest. The upper cable station is located 70M above sea level. The mountain ridge stretches from west to east, rising towards the east. This ridge is named the "ladder of Tyre", since it requires to "climb up the mountain" - as in a ladder- on the way to Tyre. 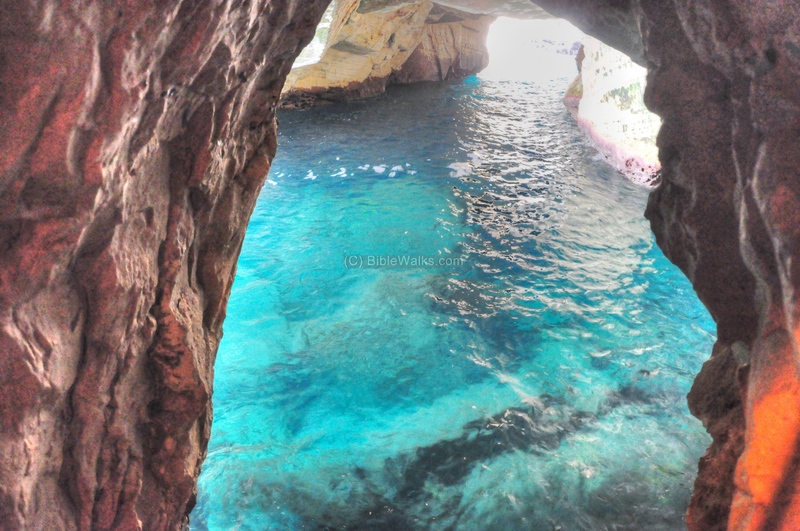 The grottoes were created by the pounding waves. They penetrated into the cracks along the cliff. The soft chalk submitted to the pressure of the water, and the cracks became eventually underwater caves. These caves are found in different heights, some of them 7M below sea level, others at 3-5M below current level. Another layer of sediment was even found above the railway tracks - 8M above the current sea level. This indicates that the ancient sea levels changed significantly due to global climate changes. The high sea level was due to global warming in the prehistoric years (250,000-150,000 years ago), when the sea level increased significantly following the melting of the icebergs. Evidence of the high sea level was also found in the Carmel caves. 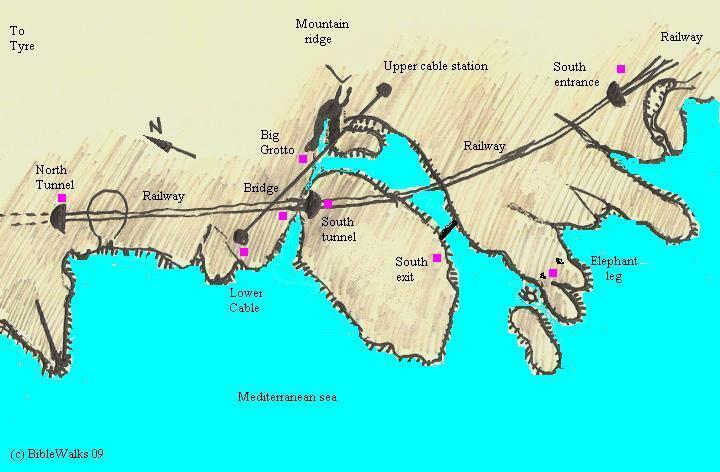 A detailed diagram of the site is seen below, with indication of the major sites. You can point & click on the purple points to navigate to the selected point. The area was (probably) mentioned in the description of Joshua's conquest (12-13th C BC), where the Bible described the northern area where he chased the Canaanites. Joshua 11:8: "And the LORD delivered them into the hand of Israel, who smote them, and chased them unto great Zidon, and unto Misrephothmaim, and unto the valley of Mizpeh eastward; and they smote them, until they left them none remaining". 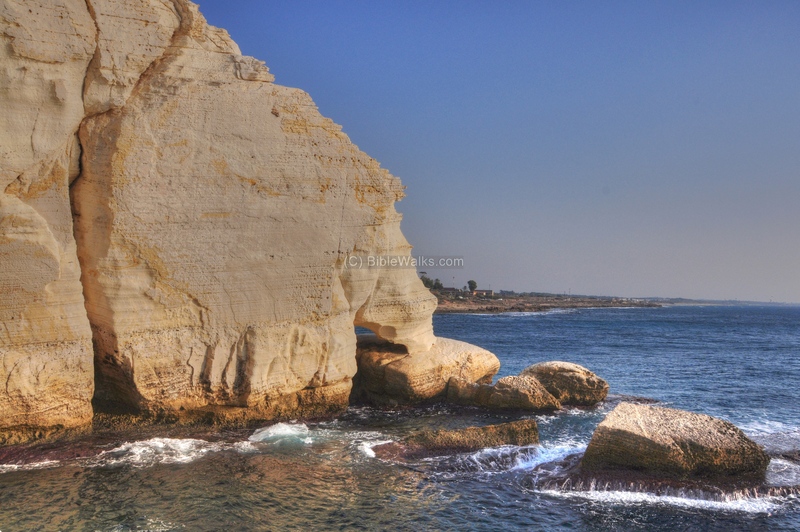 The term "Misrephot-Maim", is identified by some scholars as the salt industry at this site, south of Rosh Hanikra. Note that a large Tell is located on the south-west side of Kibbutz Rosh Hanikra, and dated to the Bronze age. Today it is totally destroyed. This may have been the main city at the Biblical times. 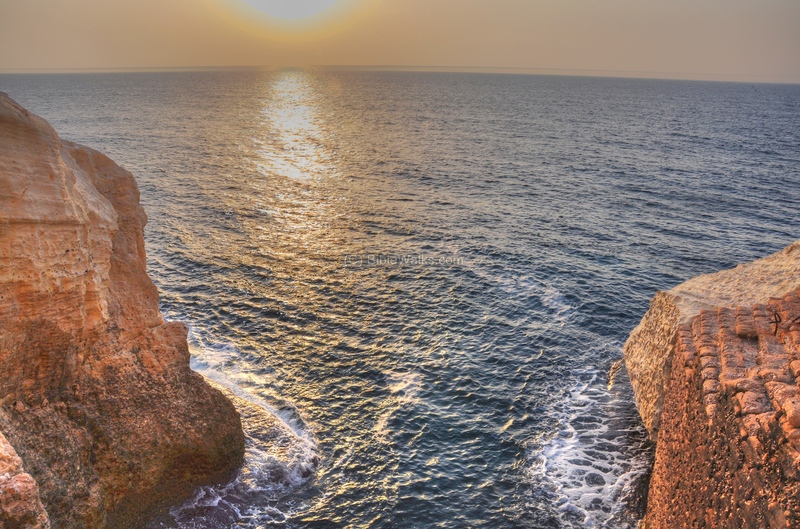 The ancient coastal route, the western section of Via Maris, passed at Rosh Hanikra starting from the Bronze age. This was since it was the lowest point in the mountain ridge of the ladder of Tyre - "only" 80M height above sea level. There were no other alternative crossing points close to the northern shore. In 56AD the Romans started the construction of a Roman road along the coast, shortly after the region was declared by Claudius as a Colony (Col Ptolemais). The coastal road connected Acre and Antiochia. 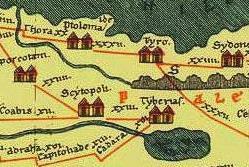 The Peutinger map (Peutingeriana tabula) of the 4th C Imperial Roman roads shows the coastal way from Acre ("Ptolemaide" in the top left) to Tyre ("Tyro"). The distance is indicated as "XXXII", meaning 32 Roman miles - or 48KM. 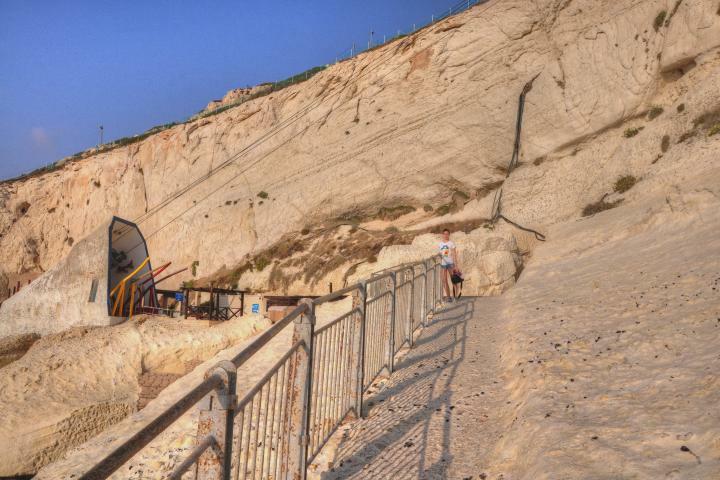 The Roman road traversed Rosh Hanikra by ascending and descending the hill. 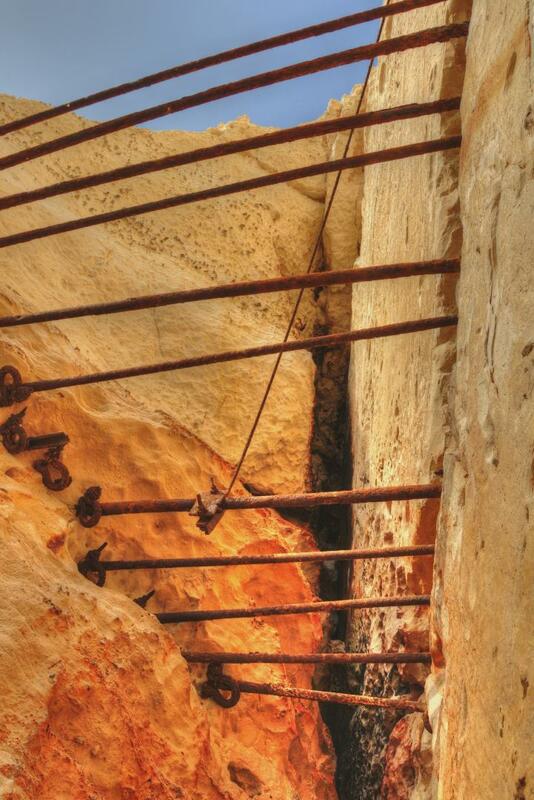 At those times there were no tools to dig a long tunnel through the mountain. 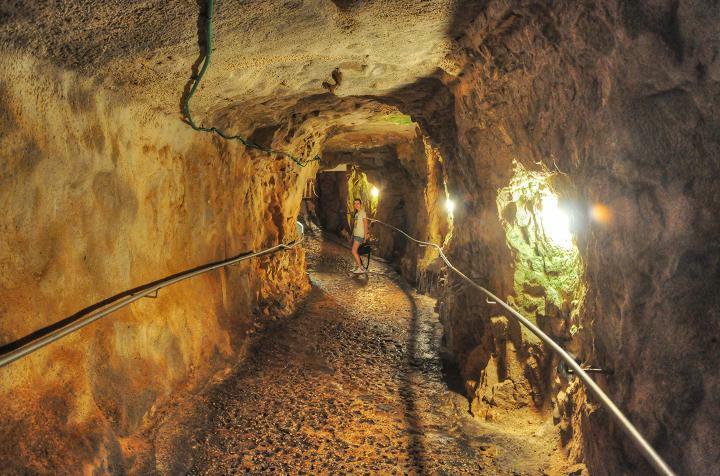 A section of the ancient road was found 50m below the modern road. A village was established south of Rosh Hanikra during the Roman period. The villagers were fishermen, rock cutters, farmers and exported wine. 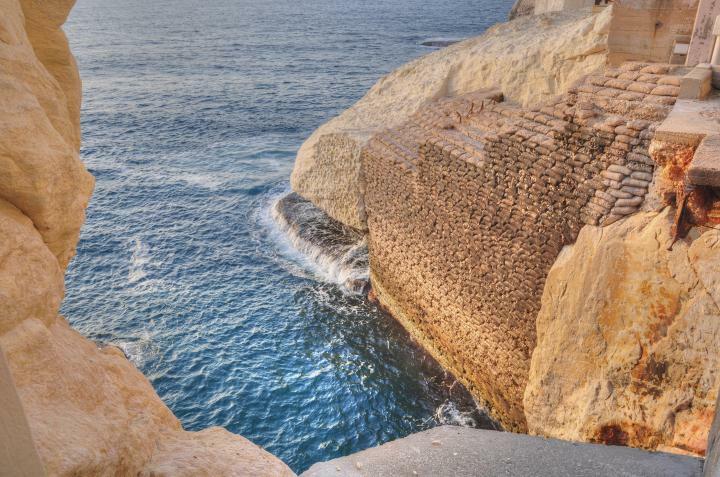 They also provided services to the Roman coastal road that connected Acre and Antiochia, which passed nearby, and climbed up the hill. For more information, check the Masref web page. 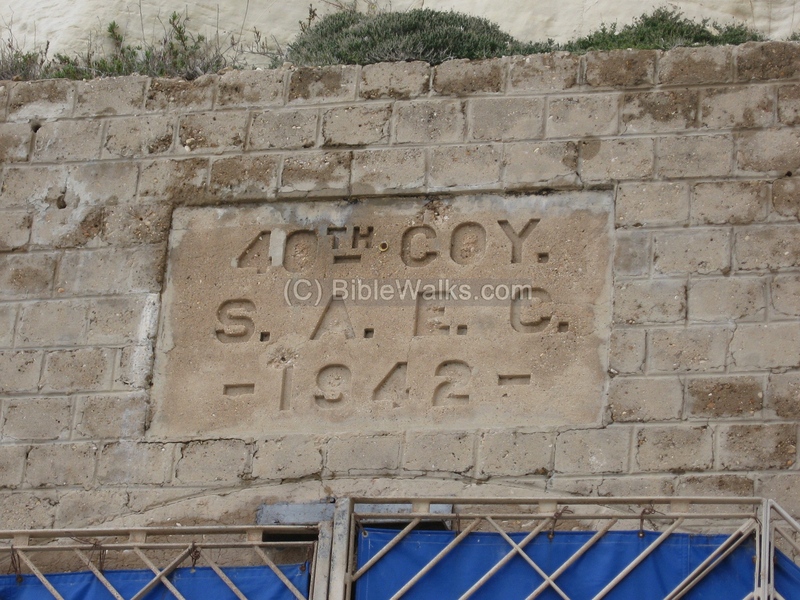 During WW1 (1918) the British build a road that connected the North of Israel and Tyre, Lebanon. The road was built in parallel to the ancient road, climbing up the hill and continuing along the shore. After the fall of the Vichy government in France (summer 1941), who controlled Lebanon, the British decided to link the Europe with Egypt through a railway line starting in Tripoli, Lebanon. 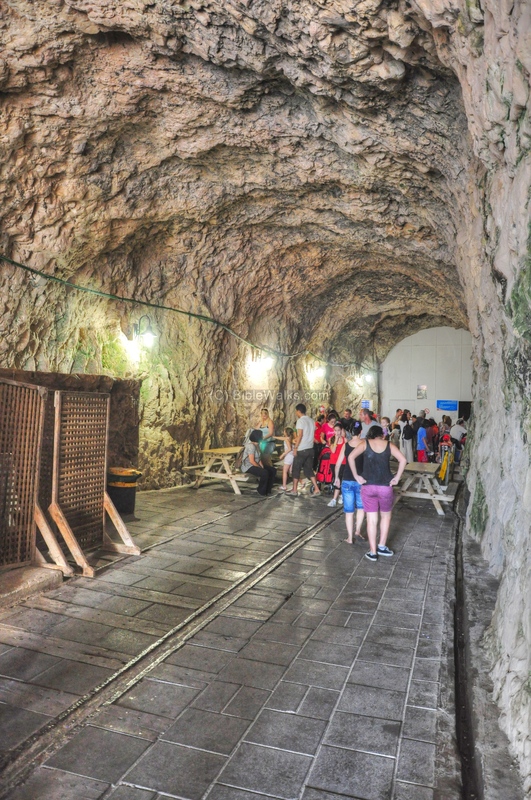 In 1942 engineers of the British Army (of the New Zealand and South African engineering units) dug a tunnel through the mountain, and laid a railway that connected Israel and Lebanon. The railway served the British military from 1943 until 1948. The bridge of the railway was blown up by the Jewish Haganah fighters in March 1948, under the nose of the British soldiers, in order to prevent Lebanese arms being smuggled into the rising state of Israel. Since then the railway is closed. 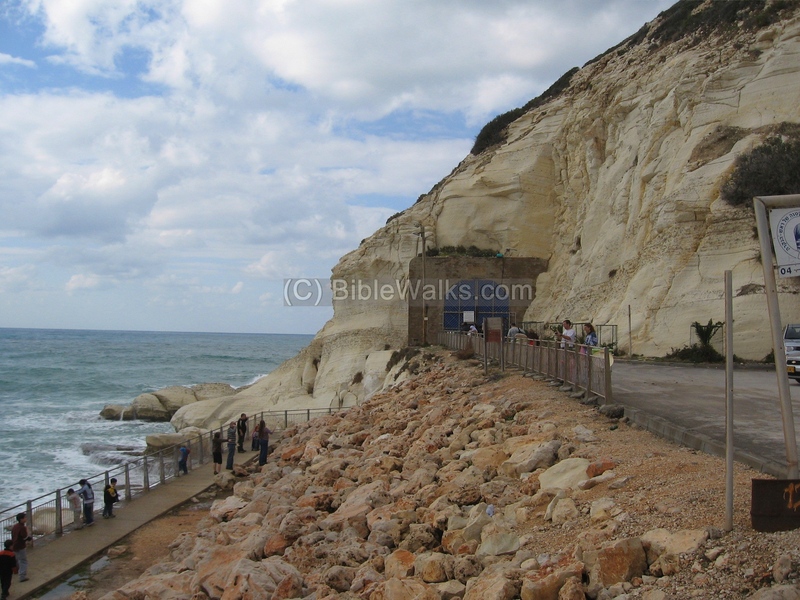 Kibbutz Rosh-Hanikra was established in 1949, 1KM east to the site. 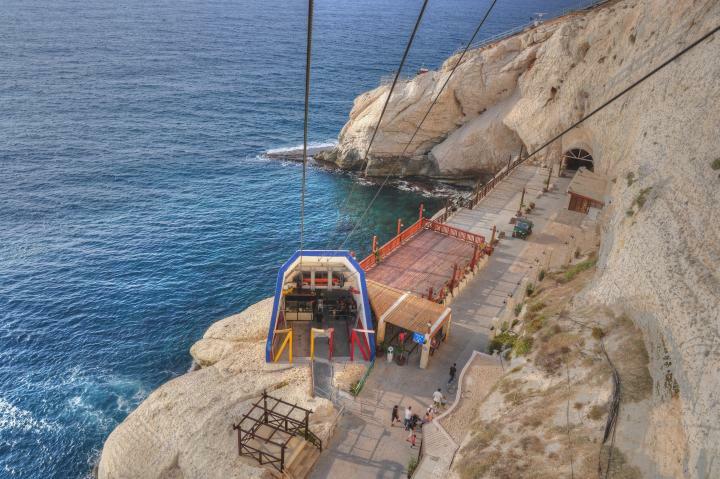 In 1969 the Kibbutz initiated the tourist project, which included the cable car and a restaurant. 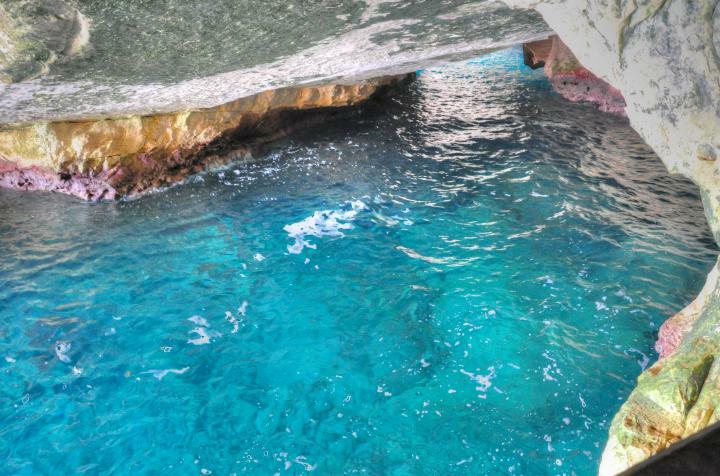 The main attraction is the grottoes, which are the result of geophysical process that has been in creating this nature reserve. 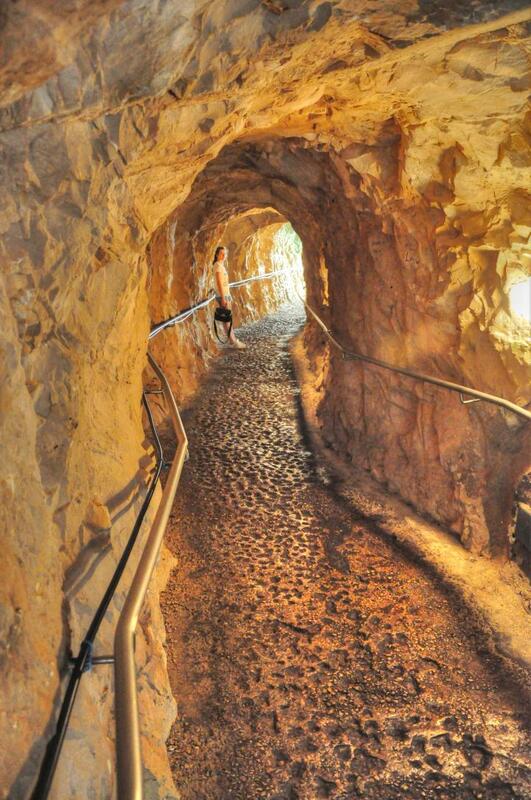 A new tunnel trail was cut into the cliff at a total length of 200M, which allows an easy access. The tourist site is open to the public and attracts hundreds of thousands of visitors every year who come to this landmark and nature wonder. The operators of the site call it "A love story between the sea and the rock". 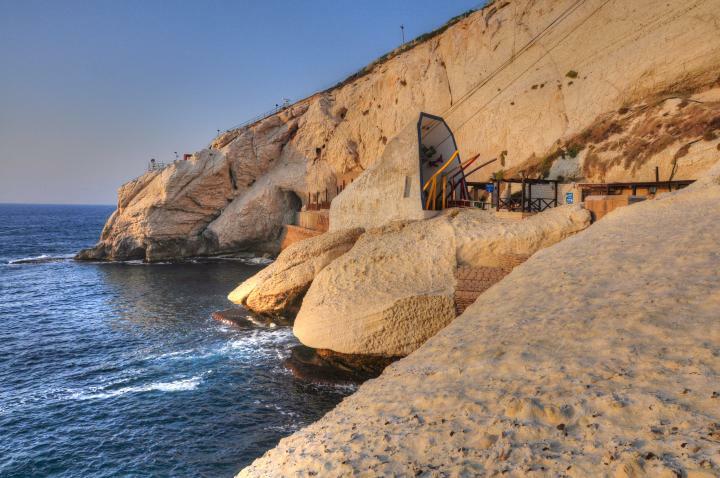 Rosh Hanikra is located on the sea shore, at the crossing point between Israel and Lebanon. 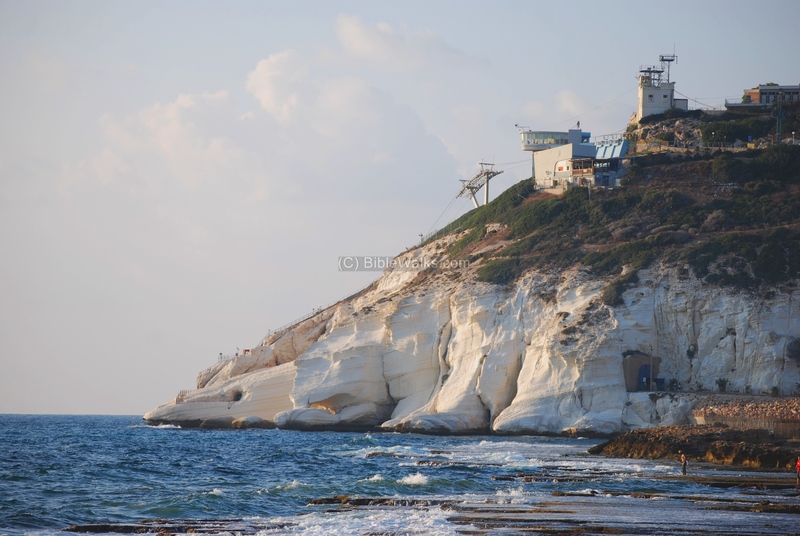 The white rocks on the shore are the location of the grottos (Nikrot), which gave the site its Hebrew name (Head of the grottos). The border station is on the top-right side, while the cable car station is seen on the top-center. The entrance to the British railway tunnel can be seen on the bottom right side. On the top of the hill, at the border point, is the sign seen below with distance between the two capitols - Jerusalem and Beirut. The border is currently closed and limited to special cases and UN personnel. One day, hopefully soon, citizens of both countries will be able to travel these 325 KM freely. A short and steep cable car ride descends 70M from the top of the cliff down to the lower station. The lower station is seen in the photo below. 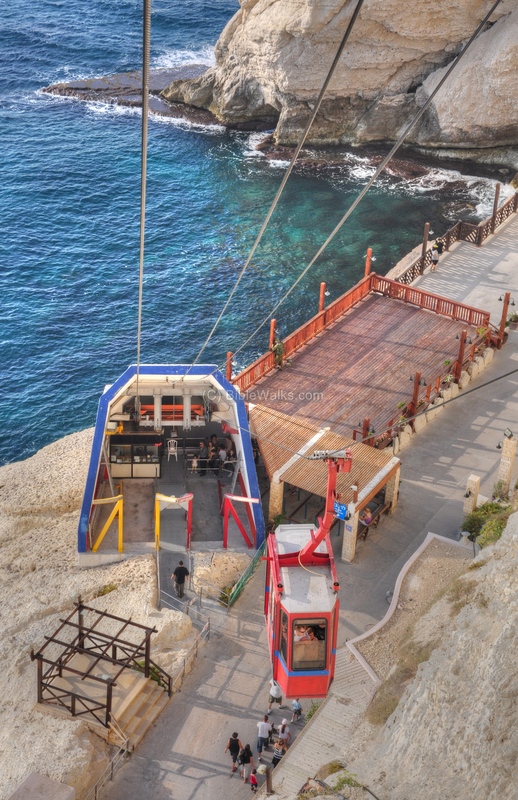 Although this is the steepest and shortest cable car ride in the world, it provides an easy access to the wonders waiting between the rocks. On the north side of the lower station is the north railway tunnel, seen on the upper right side. A closer view of the tunnel is seen below, which is quarried into the northern cliff. Beyond the sealed edge of the tunnel is Lebanon. Today, the tunnel serves as the place of the light and sound show, a 15 minute multi-media experience of the story of the grottoes and the history of the railway. The railway tracks can be seen on the floor (but no train will arrive here until there will be peace between Lebanon and Israel). On the southern side is the other tunnel, which leads to the Israeli side of Rosh Hanikra. A bridge connects the north and the south tunnels. The photo below shows a view of the tunnel, and the cable car in the background. The southern entrance to the tunnel is seen in the photo below. 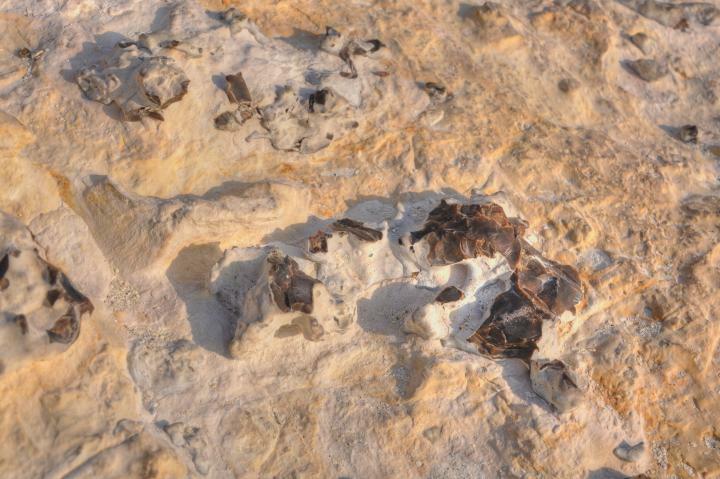 This picture was taken on the external side, accessed from the southern boardwalk, near Khirbet Masref. A sign of the date of the construction is seen above the gate. 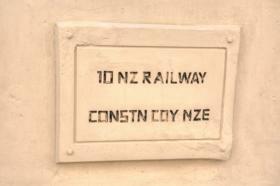 The inscription "40th Coy SAEC" (South African Engineering Corp, company 40) is the name of the South African survey unit that designed and constructed the railway, together with the New Zealand engineering unit. 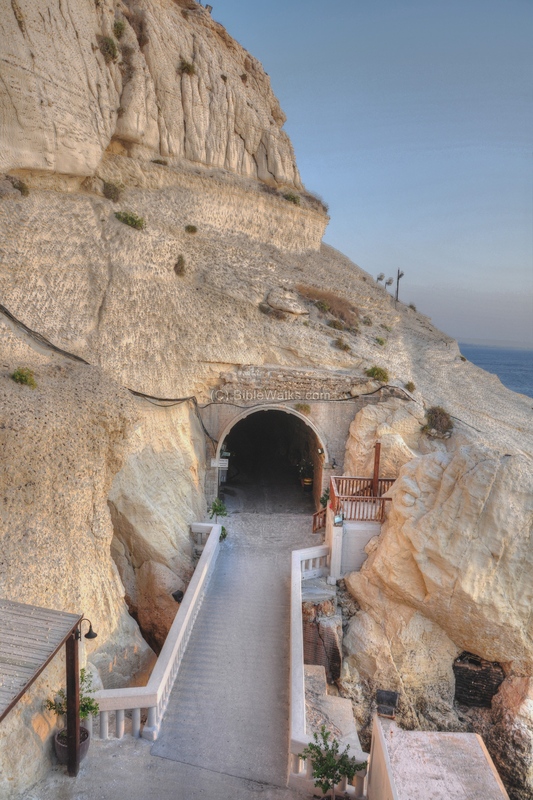 The visitors enter an artificial 200M-long tunnel, which enable an easy access to the grottos. 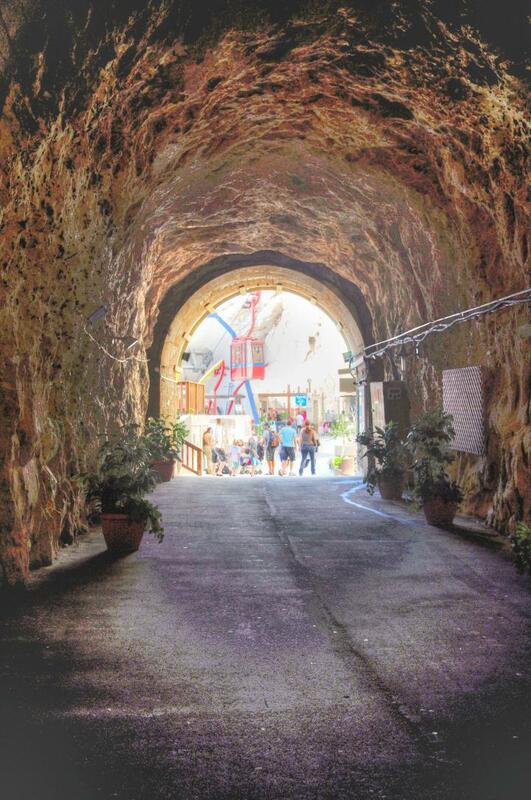 This tunnel was constructed in 1968-1969 as part of the construction of the tourist site. 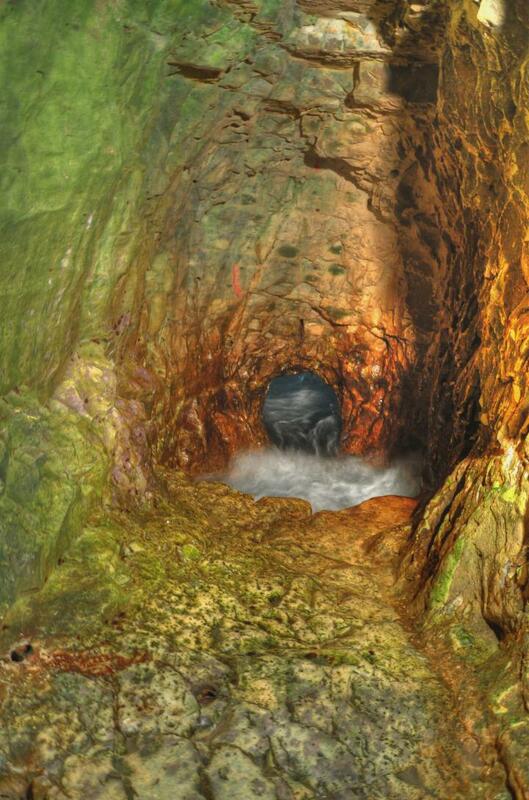 Along the tunnel are a series of grottos. 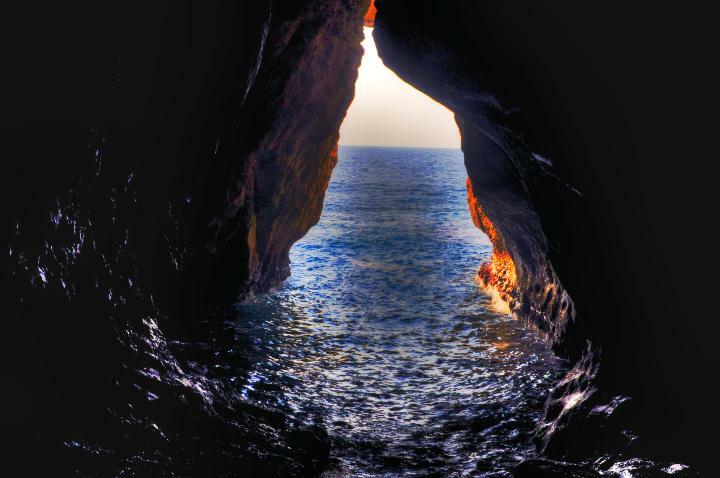 Each one of them displays a different interaction between the sea and the caves. The one below is located near the southern side of the tunnel. Another view of the sea and the rock is seen below. The color of the water and its reflection on the rock changes during the time of day. One of the grottos is named "The whale's mow". The sea water push in and out of the small cavity. It is like Jonah is looking into the stomach of the whale that swallowed him (Jonah 1,17): "Now the LORD had prepared a great fish to swallow up Jonah. And Jonah was in the belly of the fish three days and three nights'. The largest grotto passes under the bridge, which connects the north and south railway tunnels. This cave is 16M high. The sea water pushes in and out in a rhythmic pattern, and the natural light show is mystical. A view of the opening to the sea is seen below, and the edge of the bridge is seen at the top of the opening. While standing at this site, you can hear the waves banging inside the canal and the walls of the cave. You may also possibly hear the squeaks and shrieks of the bats and birds which reside in the cracks of the ceiling of the big grotto. A walk inside the tunnel leads to the exit on the south side. Please bring good shoes or sneakers to avoid slipping over the wet walkway, and walk carefully. At the edge of the tunnel is an opening with an open section, a sort of a terrace, as seen below. Looking up, the colorful rock and the rusting metal pipes create a colorful picture. The photo below shows a view of the cliff and the sea, as seen from this opening. After another short section, there is an exit out of the cliff. 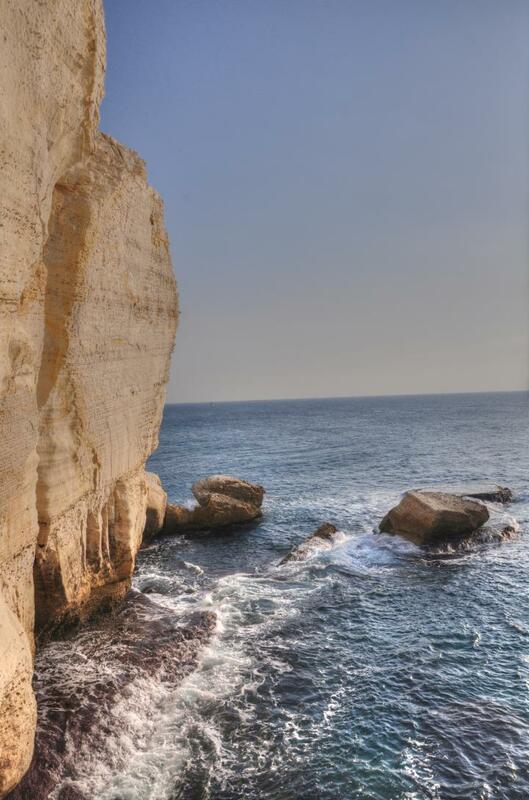 Looking towards the sea, there is a great view of the cliff and the sea. The group emerging from the tunnel, seen below, admires the scene. The trail then takes you around the edge of the cliff and back to the cable car station. 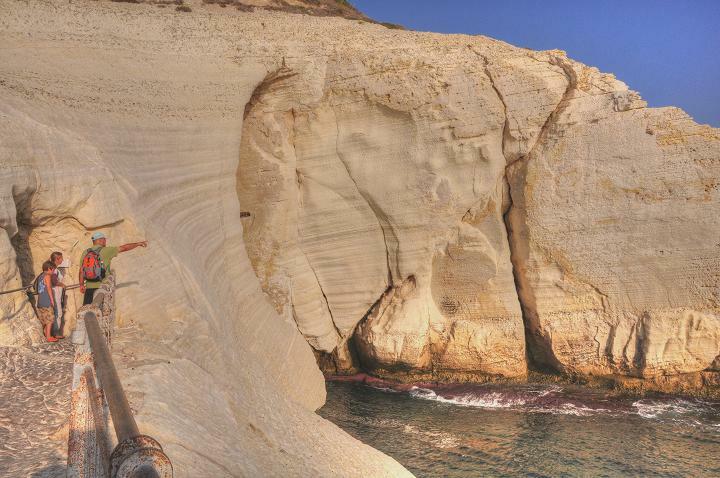 The white cliff is actually made up of chalk, a soft sea sediment, interwoven with dark flint stones. A close look at the rock at this point is seen below. The dark flint stones were created in another geological period when the sea was shallow and warm, and the accumulation of sea creatures and seaweed consolidated and formed these stones. A bridge connects the south and north tunnels, just above the large grotto. It was blown up by the Jewish Haganah fighters in March 1948, under the nose of the British soldiers, in order to prevent Lebanese arms being smuggled into the rising state of Israel. A closer view into the British fortifications that sealed off the sides of the bridge. 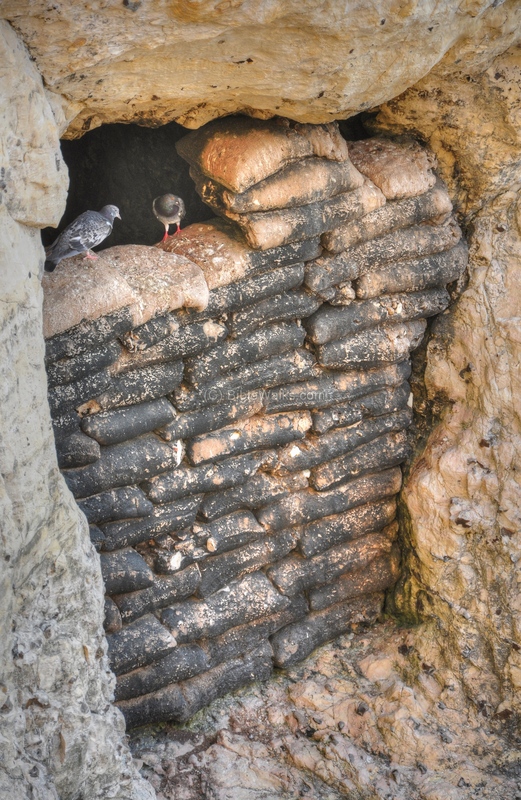 A pair of pigeons nested here among the cement-filled sacks. A romantic sunset picture is seen below. Along the path of the cable car we saw a cute Hyrax (rock rabbit, or Hebrew: Shafan Sela) which is a typical mammal in the Galilee. Several groups of Hyrax live in the rock grottoes, and a male leader is often seen here watching his group and wondering what are these tourists coming for. 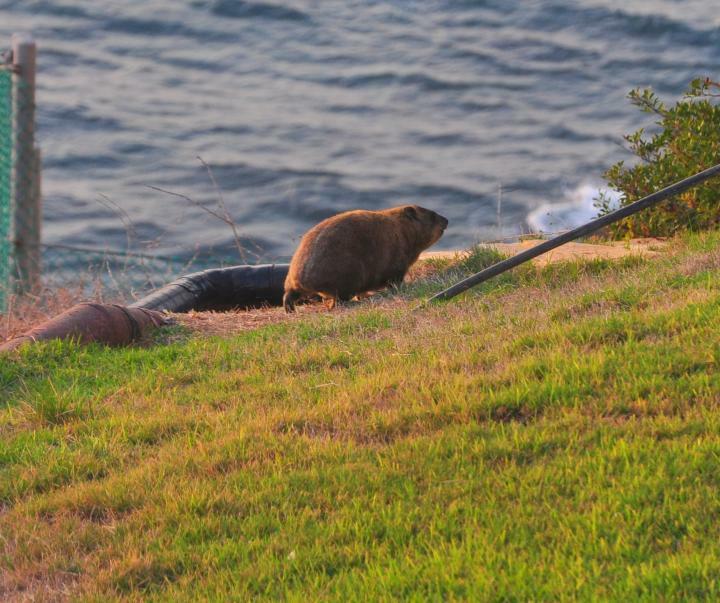 The Hyrax is mentioned in KJV Bible as coney (an English word for rabbit), as in Leviticus 11 5: "And the coney, because he cheweth the cud, but divideth not the hoof; he is unclean unto you". Joshua wins the battle of waters of Merom, and chases the Canaanites until " Misrephthmaim". According to some scholars (Vilnais), the place was Masref which preserved the ancient name. "Maim" is waters in Hebrew, and this indicates a coastal location. "So Joshua came, and all the people of war with him, against them by the waters of Merom suddenly; and they fell upon them. And the LORD delivered them into the hand of Israel, who smote them, and chased them unto great Zidon, and unto Misrephothmaim, and unto the valley of Mizpeh eastward; and they smote them, until they left them none remaining. This text describes the borders of Israel after death of Joshua, and Misrephothmaim may indeed refer to the site which is even today located on a natural border, and at the ancient times was a topographic barrier between the Holy Land and its neighbors (Tyre and Sidon). "All the inhabitants of the hill country from Lebanon unto Misrephothmaim, and all the Sidonians, them will I drive out from before the children of Israel: only divide thou it by lot unto the Israelites for an inheritance, as I have commanded thee". 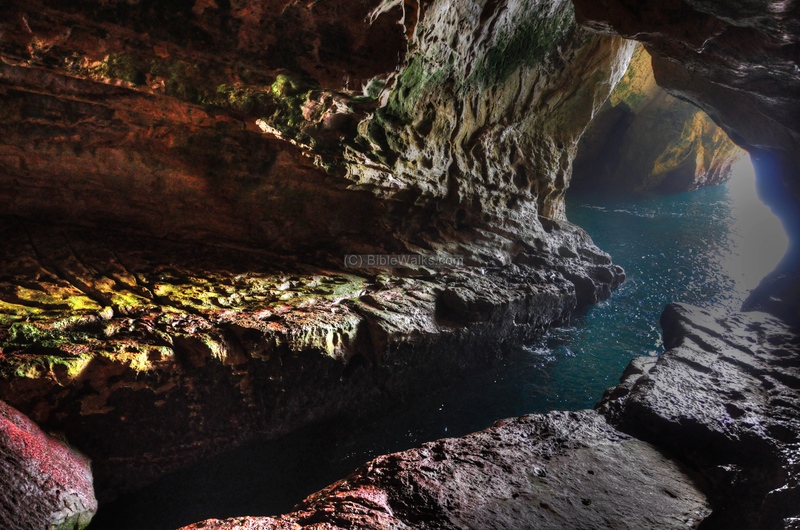 Rosh Hanikra - Hebrew: Nikra: grotto. Rosh: Head. The name is a translation of the Arabic name. Sulam Tsor - Hebrew (Talmud): the "ladder of Tyre" - the name of the mountain ridge that separates Israel and Lebanon. Misrafot-Maim - the Biblical name of the area. Misrafot - Hebrew: places of fire, or also area where salt was prepared (since it baked in the sun). Maim - waters. May also be derived from "Mi-Yam" which means "from the west".